6:50 Teaching kids about money: round-table kickoff with Joe and Len. 10:26 Is footing the whole bill for your kid’s college smart? It’s important for children to have at least some shared skin in game when it comes to paying for college. Earning scholarships, working part time, and contributing savings are all viable options. Millennials have a very healthy appreciation for the expense of college, the burden of student loan debt, and the importance of getting started early on saving. Here’s a generation that knows what its college-bound kids are getting into financially. As family income diminishes, so does the net price tag of college — often dramatically and even entirely. So low income students should not cross elite schools off their list solely because of high sticker prices. Research the net cost based on your unique situation. Check out online tools like The College Board’s net price calculator. College isn’t always the answer. A vocational route is an appropriate alternative for some kids. 14:31 Where does saving for college sit in on your priority list? Did you pay your way through college? 15:51 Len explains his bizarre make-up fetish and leaves Joe wondering out loud: “How often am I speechless?” Funny and awkward all at the same time! Make saving for college a line item in your monthly budget. Get started early, and consider a tax-advantaged 529 account. You’ll be in good company. There are now 12.3 million accounts with an average balance of $20,934. Don’t assume your child is incapable of paying for college and getting through debt free. It’s very doable using a combination of techniques like part time work, scholarships, staying in state, starting in community college, or committing to military service. Tai did it (more recently than Len). Set expectations with your kids regarding how much they will contribute to college expenses. Whether you plan to pay for all, some, or none of their college experience, tell your kids early and often. 21:26 Should kids get an allowance? Should it be tied to chores? Always have at least some unpaid chores. If Tai tells you to clean the dishes, clean the dishes! No questions asked. That’s just part of being a participating member of the McNeely household. Be clear and specific about the expenses you expect your child to cover with chore or allowance income. When it’s gone, it’s gone. Teach consequences. Don’t let the kids come running back to Mom or Dad for a hand-out when they’ve mismanaged their funds. Use allowance or chore payments as a tool to teach your kids how to manage money. Change your system as your kids mature. Increase expectations and responsibility over time. For example, you might give your toddler a quarter for helping you unload the dishwasher, but your teen? Umm, no. There’s no one right way to handle money with your kids, but there’s one wrong way: flat out giving your kids money with no structure, no counsel, no responsibility, no constraints, and no consequences. That would be lame. Duh. Let teens practice budgeting by putting them in charge of a very specific expense like clothing. Pick a balanced system that emphasizes 3 key concepts: money is earned through diligent work, not all work is for money, and budgeting is a critical life skill. Teach your kids to explicitly track money using a system of record. That system could be managed with pen and paper like Len’s paper ledger system, in a spreadsheet, or online using a tool like FamZoo. 29:01 What age should you start teaching your kids about money? As soon as you kids are able to talk or as soon as they ask you for something at the checkout stand (often these events coincide! ), they’re ready to start having basic conversations about money and how it works. A piggy bank is a great starting point. Move on to a ledger-based tracking system when ready — whether it’s with a stone and chisel like Len’s or with fancy online tech like FamZoo’s. 30:33 If you’re struggling with money, how do you teach your kids about money? Don’t let your struggles with money prevent you from teaching your kids about money. If you’re having trouble, explain to your kids why (in an age appropriate, non-scary terms). That’s a valuable lesson and encourages transparency. You can teach transparency and tracking even if you don’t have much money. All you need is found change from the sidewalk to start spend-save-give jars with your kids — no allowance or chore money necessary. If you absolutely must borrow from your kid’s piggy bank (a scenario mentioned in the article but not something we recommend), replace the money with a written IOU and be sure to make good on it when you can. There’s zero tolerance for theft here. As soon as parents start teaching their kids good money habits, the parents tend to improve their own money behavior too. Win. Win. Your kids are like your little accountability partners. Sound money management is not complicated. It’s mostly basic knowledge coupled with building and maintaining solid habits. Intimidated by investing? Check out low cost, highly diversified index funds. Contribute regularly over the long haul. Get your teens in on the action early with a family 401(k). Involve your kids in everyday household finance discussions. Talk through paying your bills, making a purchase on credit card (including how you alwayspay off the amount later! ), and how much everyday items and services cost. You aren’t scolding your kids, you’re just raising their awareness. Len wants to make sure his kids know “nothing comes out of the sky for free.” Apparently, there are no gift showers at Len’s house! Ron Lieber’s recent book, The Opposite of Spoiled, is a great resource for practical guidance on talking to your kids transparently about money. 37:20 What’s happening at His and Her Money? Tai and Talaat’s new book “Money Talks” is coming soon! 38:02 What’s happening at LenPenzo.com? How to downsize your life in 9 easy steps. 38:24 What’s happening at FamZoo? On the blog, we’re talking philanthropy: Six Tips for Building the Charitable Giving Muscle in Your Kids. On the product side, we just made it super easy to order our prepaid cards from your phone. And, that’s a wrap folks! How about you? 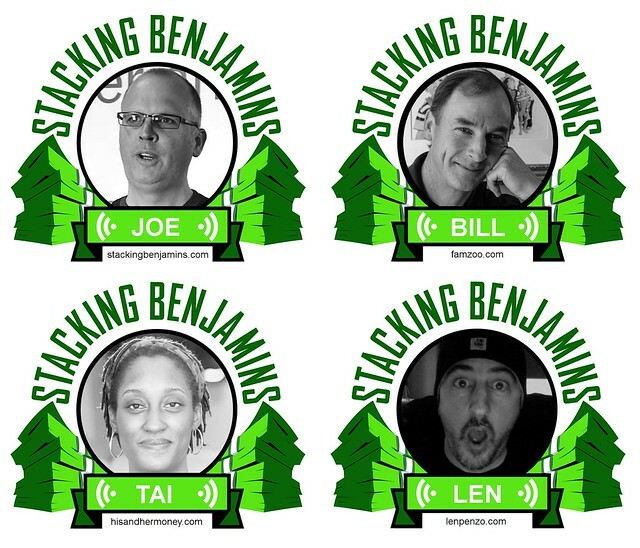 Do you have some clever ideas for teaching kids how to stack those Benjamins? Share your tips with us in the comments.